Product code: A Premium White Balsamic Vinegar Category: White Balsamic Vinegars. Delicately combines the complexity of the Gravenstein’s larger than life flavor with with a well-balanced White Balsamic Vinegar. The Gravenstein Apple is a hard to find varietal due to the difficulty farmers have cultivating it. In addition to contending with a very finicky tree, it's also an apple that does not travel or store well. It's best enjoyed during the relatively short season and isn't typically shipped far. In the US, it's grown in pockets up the west coast and is highly prized for its heady ambrosia perfume, and crisp, sweet-tart cream colored flesh. Mama Stapes remembers her Dad – long gone now – and how he was so proud of his Gravenstein tree in Bellingham, WA. Positively shines when paired with ANY of our Fused and Infused Olive Oils as well as Roasted French Walnut Oil or Toasted Almond Oil. Drizzle over Fresh Melon for a wonderful surprise! This White Balsamic is a perfect combination of the lemon-lime flavor of Thai Lemongrass blended with Spearmint. It is a light, refreshing and amazingly versatile Asian-inspired balsamic with a crisp and clean natural flavor that will have you thinking in a whole new, creative way as it blends beautifully with mostly all of our Olive Oils. Try mixing Lemongrass Mint Balsamic with Baklouti Green Chilli, Cayenne Red Chilli, or Chipotle Olive Oils for a marriage of heat and cooling mint. Emulsify with Cilantro & Roasted Onion, Garlic, or Persian Lime for a tangy marinade or vinaigrette. Combine with sparkling water or tea or mix with rum for an unbelievably delicious mojito. Get inspired to cook a stir fry by mixing Lemongrass Mint with our Japanese Toasted Sesame Oil. Made with White Trebbiano Grape Must, our White Peach Balsamic retains its white color because it is not caramelized. The resultant crisp vinegar possesses a touch of sweetness. Extremely adaptable, it can be paired with any of our EVOO’s, as well as our fused and infused oils to make light, tart vinaigrette. The acid in this signature balsamic draws out the intense flavor of the peach. Balanced with the tart acidity, this variety evokes hot, laid-back Havasu summer days, lazing out on the pontoon in Copper Canyon, sipping peach sweet tea. Use this balsamic to brighten up summer dishes like marinades for grilled meats and seafood, fruit salsas, spinach salads, and crushed berries for dessert. Try as a glaze on Halibut or zing-up BBQ Grilled Peaches. Creamy, sultry, pure Madagascar vanilla and the bright citrus of Cara Cara oranges. Serve with fine chocolate, drizzle over fruit salad, in sparkling water or mixed drinks. Pairs well with our Butter Infused, Blood Orange or Baklouti Fused Olive oils. Papa Stapes loves with our Toasted Sesame Oil as vinaigrette for salads and veggies. A delicate white balsamic with a small tinge of acidity that beautifully complements the herbaceous aroma of oregano. This delicious white balsamic is perfect in savory marinades and salad dressings giving your dish a true Mediterranean flair. Playfully tart and pleasantly sweet, our Sicilian Lemon White Balsamic has a perfect balance of acidity with a crisp, lemon flavor and aroma. Fabulous with seafood, in dressings or in mixed drinks. Pairs well with Roasted Sesame oil for a fantastic salad dressing or marinade! This well-rounded, citrusy white balsamic makes an excellent substitute for a lemon or lemon juice. It finishes with just a hint of sweetness, and adds summer freshness to meats and salads alike, like a cool glass of lemonade on a hot day. 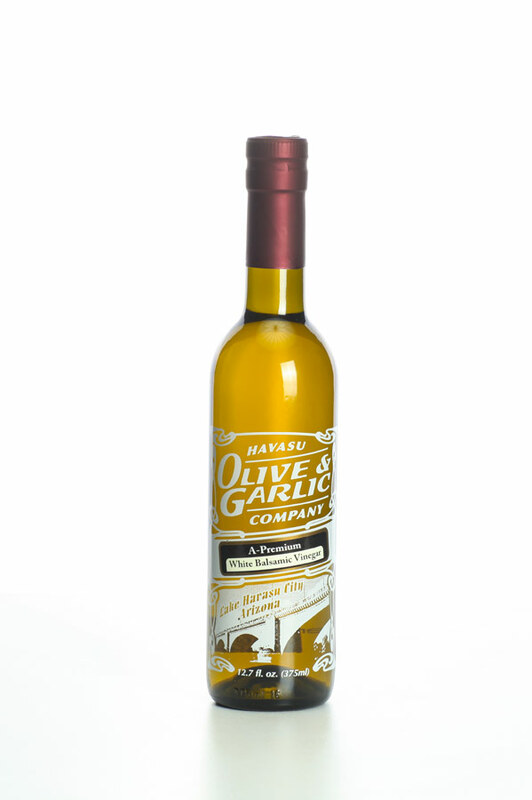 At Havasu Olive & Garlic Co we are very fond of pairing with our Persian Lime Olive Oil to mimic the unique flavor of a lemon-lime soda or by adding a teensy splash to lemon Drop cocktails. For Middle Eastern flavor combine with our Tuscan Herb Olive Oil in Tabouleh or on Lamb. Our coconut white balsamic is truly unique. We have infused our wonderfully sweet, yet tart white balsamic vinegar with all natural coconut flavors. Mix with the Persian Lime olive oil, Lemon or Blood Orange Olive Oils for a fantastic salad dressing. Pair with the Cilantro and Roasted Onion olive oil for a great marinade. Even folks that are not fans of Balsamic Vinegars are stunned by how good this tastes. Salad Greens topped with Shrimp, Avocado, Red Onion, a splash of Fresh Lime and Pineapple chunks is outrageous. Blend a skosh with a touch of Pineapple Juice in a Jerk Seasoning to marinate Chicken Caribe. This is THE House Favorite White Balsamic Vinegar! Clean, crisp, and sparkling, our Cranberry Pear White Balsamic is as delicious as it is beautiful. Use this product in dressings, marinades, sauces, over fruit and as an inspired cocktail or spritzer. Pair it with our Blood Orange or Persian Lime olive oil. This White Balsamic from Modena boasts a lovely rose blush. It has an amazingly fruity, complex bouquet that shines in a multitude of culinary applications. Use to dress fruit or vegetable salads, as a marinade, a glaze for poultry, with gelatin for delicious fruit!